From breeding miniature cows to importing water buffalo, Cuban leaders have long gotten creative in their effort to remedy food shortages. Now, they are proposing ostrich and rodent farms as an answer, prompting ridicule from a weary population. Meat and eggs have become hard to find in the Communist-run country in recent months due to a declining economy. Meanwhile officials are touting the potential of the flightless African bird and the hutia, a rodent native to Cuba that can weigh up to 8.5 kg (19 pounds). “An ostrich lays 60 eggs, and of those you get around 40 chicks, and from these 40 chicks per year you get four tons of meat – whereas a cow just gives birth to one calf and after a year it’s only a yearling,” said Guillermo Garcia Frias. Garcia Frias, 91, holds the honorary title of commander of the revolution as a former guerrilla in Cuba’s 1959 revolution and heads state company Flora and Fauna that is developing seven ostrich farms. He spoke at a roundtable discussion broadcast on state TV last week. He lavished praise on hutias for their “level of protein higher than any other meat” and “high quality pelt,” noting his company was also breeding crocodiles. His comments have prompted sarcastic memes and jokes that have gone viral on social media since Cuba’s food schemes have often failed to fulfill expectations. In one meme, a Cuban arrives home with a live ostrich he got via the state ration card. In another a flock of the birds from Cuba arrives at the Mexican-US border seeking asylum. Cubans also joked the state might give them an ostrich per household, as it did with chickens during the deep economic depression of the 1990s following the fall of former benefactor the Soviet Union. “They should be focusing on chicken, a basic foodstuff that has disappeared, rather than something so unusual,” said Elizabeth Perez, 22, a law student who said she hadn’t been able to find chicken in the supermarket for a month. 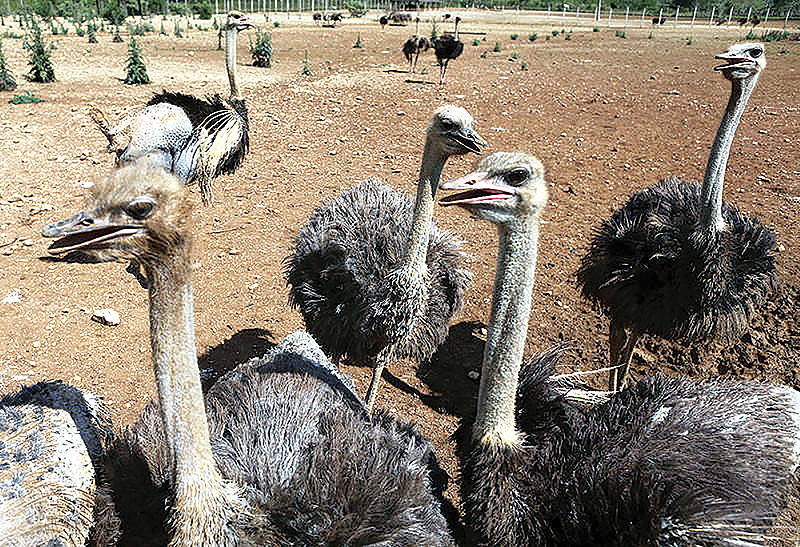 Ostriches are already farmed around the world, particularly in South Africa. In the United States, the bird is often served more as a novelty than a staple. The red meat is said to resemble lean beef, with a gamey flavor. For some, Garcia Frias’ comments recalled late leader Fidel Castro’s genetic engineering project to produce high-yield dairy cows. His cow Ubre Blanca or White Udder is in the Guinness Book of Records for the highest milk yield by a cow in one day: 110 liters (29 gallons). Her offspring were not as productive so the experiment petered out. Cuba imports 60 to 70 percent of its food because of inefficient central planning of the state-run economy and the effect of the decades-old U.S. trade embargo.